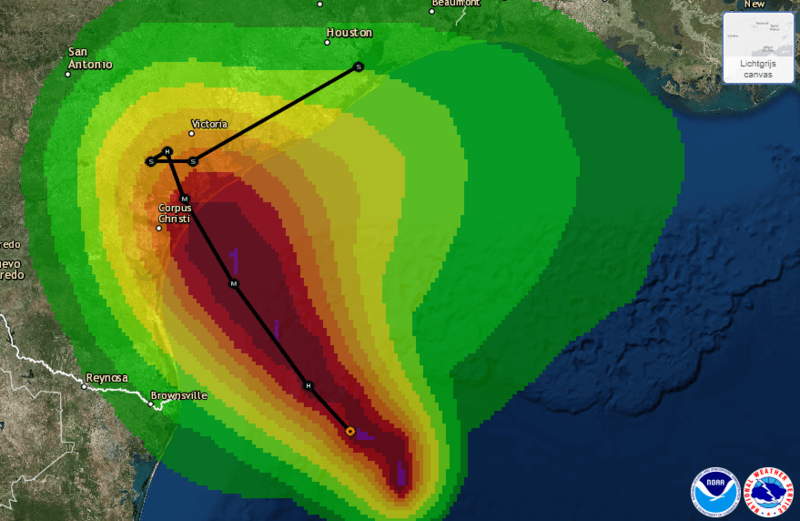 Oil and gas companies in the Gulf of Mexico are preparing for the arrival of hurricane Harvey. Shipping has also been forced to take necessary measures, as Harvey is expected to bring extremely turbulent conditions. Harvey, the name given to the hurricane by the National Hurricane Centre in Miami, is already north of the Gulf of Mexico. The tropical cyclone has rapidly increased in strength in the last two days and is expected to increase in strength further. It is forecasted that Harvey will make landfall on Saturday afternoon in the U.S. state of Texas, but that’s when the problems may just begin. It is then anticipated that Harvey may turn towards the North Western Gulf of Mexico travelling towards central Texas by the middle of next week, at which stage the impact of this hurricane can be truly assessed. At the time of writing, Friday morning, Harvey is Category 2 hurricane (based on the Saffir-Simpson Hurricane Scale, which runs from 1 to 5). Wind velocities are measured up to 140 km/hour, close to the centre (‘eye’) of the hurricane. The air pressure in the exact eye of the hurricane are 967 hPa. During the next 24 hours, it is widely anticipated that the force of the hurricane will increase. By the time it makes landfall at 12.00 noon on Saturday it is expected to be a Category 3 storm, with wind velocities up to 200 km/hour and air pressure in the eye dropping to lower than 950 hPa. When it reaches land, Harvey, as a Category 3 hurricane will be the strongest hurricane that has hit the US since Hurricane Wilma in 2005. 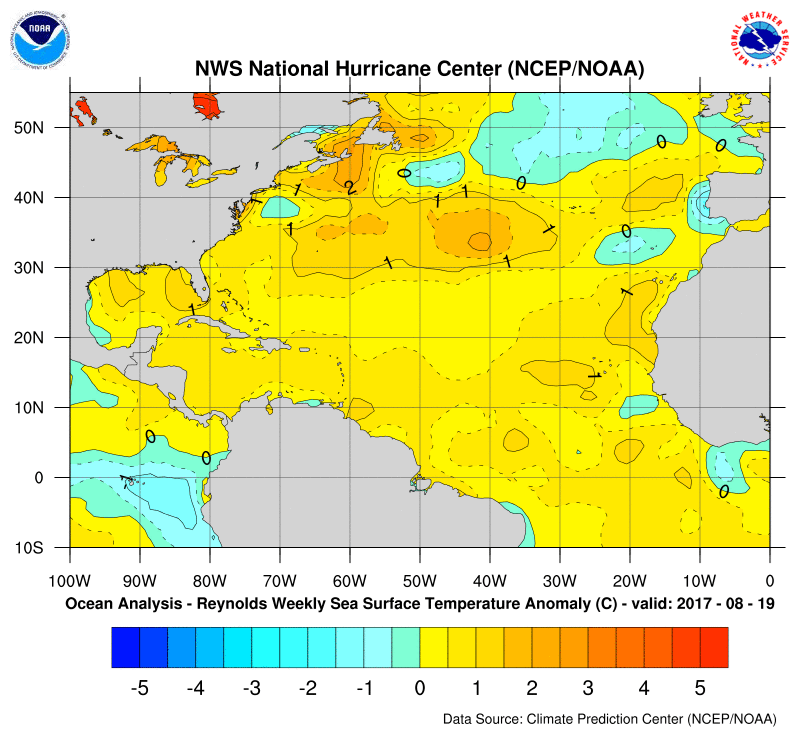 Harvey’s strength appears to have been caused by ‘ ideal’ atmospheric conditions with a particularly warm sea underneath. During the past, few months it has been very warm and sunny in the Southern US and also just north of the Gulf of Mexico. The seawater has reached a temperature of 30 to 32 degrees. This hot substrate delivers continuous energy to the cyclone which contributes significantly to Harvey’s force. Almost a third of the American refining sector lies close to the path of Harvey, both in southern Texas and the western coast of Louisiana. Wind, waves and the heavy rainfall can all contribute to lower production levels in the Oil and Gas Industry. At sea, the first platforms have been evacuated. Oil prices were already rising, and gas prices rose even more because of the increased uncertainty about production over the coming period.